Texans opting against veteran quarterbacks? Published: Feb. 18, 2016 at 03:59 p.m. Updated: Feb. 19, 2016 at 09:15 a.m. In response to Brian Hoyer's Wild Card Weekend meltdown, owner Bob McNair has made it clear that the Texans will be in the market for a quarterback upgrade this offseason. While veteran options such as Robert Griffin III and Sam Bradford have been linked to Houston via the rumor mill, John McClain of the Houston Chronicle is convinced the team will look to the draft for its next franchise quarterback. "They want to draft (a quarterback) in the first round. They're tired of using retreads," McClain told Tim McManus of Philadelphia Magazine. "They played five this year, started four. Last year they played four and started three. So they need a quarterback, and they want one that they can develop." McNair has strongly suggested that this will indeed be his front office's approach, recently noting that the Texans "have a good chance" at selecting a quarterback prospect early in the 2016 NFL Draft. 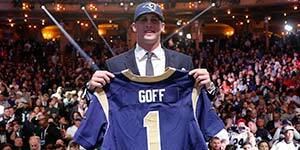 Big names such as North Dakota State's Carson Wentz, Cal's Jared Goff and Memphis' Paxton Lynch are unlikely to be on the board when Houston picks at No. 22 overall, which could lead to a reunion between coach Bill O'Brien and one of his star recruits at Penn State. "I think Christian Hackenberg is going to end up being reunited with Bill O'Brien," McClain offered. "I think that's going to be their quarterback. I think O'Brien loves the guy. I don't know that, but I just think he does based on what I've heard. "People that think Bradford is coming here, chances are they're going to be mistaken." It should be noted that McClain isn't reporting any news here. He's merely expressing an opinion based on multiple factors, including conversations with Texans sources. We give extra weight to that opinion not only out of deference to McClain's 35 years covering the NFL, but also because he's adding context to the owner's comments strongly indicating a preference for a young quarterback over a reclamation project.